Kol-Seal is a lightweight granular solid with a specific particle-size distribution for maximum bridging efficiency. It provides an economical cementing system with low-density lost circulation control and superior scouring action. 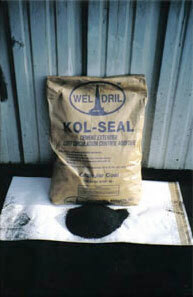 Kol-Seal is used as an extender to provide a lightweight, high yield slurry. Because of its insolubility in low surface area Kol-Seal does not require large amounts of additional water. (The additional use of water with most extenders materially reduces the strength of set cement.) The amount of Kol-Seal used varies from 5 to 50 lb. per sack of cement. The optimum proportion is normally between 10 and 25 lb. per sack of cement. Every 10 lb. of Kol-Seal added to cement will increase the slurry yield .17 cubic ft. per sack of cement, including water. Normally, one (1) gallon of water is used for every 25 lb. of Kol-Seal. Absolute Volume Occupied by 1 lb 0.0926 gal.